A great moment in time caught forever. 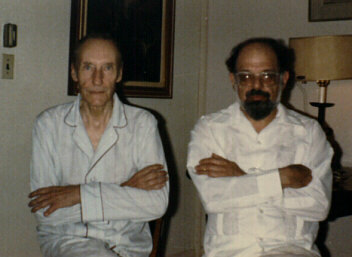 Beat Generation founders William S. Burroughs and Allen Ginsberg wearing old fashion cotton PJ's with big buttons, in William's house. Photograph by Pat Elliott, all rights reserved, used with permission. Photograph © 1997, page © 2004 George Laughead, maintainer, Beat Literature, Open Directory Project. Page posted: 28 April 2007. Hosted at WWW Virtual Library @ www.vlib.us.